With the success of our ULS line system and the extended use of the concept, we saw the potential for developing some “specialized” rod models, based on test results from use with ULS 3D+ and Multi Tip lines. We have been asked to develop some ultralight, small double hand rods for quite some time now. We decided to build these with a variation of our Switch handles to match the shorter rod length. When test-fishing them, we found that they perform absolutely fantastic as single hand rods and with this customized grip design, we felt it was only natural to name these rods ULS “Hybrid”, as they sure are something right in between a Switch- and a Single handed rod. ULS Hybrid Rods – The unexpected application. During the final stages of the development of these rods, I found myself bringing them along to quite diverse “arenas” to get a chance to fish them heavily and make up my mind about the final actions. Not far from my home, a major river flows shallow and wide around a large island before it enters one of the largest lakes in the country. This area is the scene for an exciting fishery for migratory Brown Trout that both pass through on their way to several smaller tributary and choose to stop in the area and take residence in wait for fall and spawning. Most anglers who target these fish use double handed, light Salmon rods or Switch rods to be able to throw long casts and cover a lot of water. As this summer was a hot and dry one, we saw the river run quite low for most of the time. During a few sessions in varied conditions, I decided to fish the ULS Hybrid 10’ #7 rod, using the ULS 16gr system in both the Multi Tip and 3D+ Heads, depending on the area I fished. At first, I thought I would have to adapt my techniques, focusing on fishing shorter and targeting, smaller and more defined lies, seams, buckets etc. instead of simply using long casts and a downstream swing-method. All though the close-to-mid range fishing works brilliant and with unequaled precision, I was blown away by the efficiency and the ease I found in fishing this rig on mid-to long casts even during windy conditions. Using the rod as a single hander and combining the 16 grams heads with a 35lbs Compline II shooting line worked out absolutely brilliant. I was in full control of both Spey Casts and overhead casts, even in the nasty side winds we do experience from time to time in this wide and exposed part of the river. I have a small non-scientific theory that the short line doesn’t get blown into my shoulder quite as nasty as longer heads do, merely because it isn’t exposed to the side-wind for the same amount of time. The turnover of the heads balances really well with the resistance of the 35lbs shooting line, which is nice and manageable in handling also in windy conditions. To further increase the casting- distance of the ULS 3D+ lines you can add a 5´Salmon/Sea Trout Polyleader in the front. This will increase the length of the line and make it go the distance when you have room to set the D-Loop nicely beside and behind you or stretch out a good overhead cast. After I found out how well this works, I always carry a set of these Polyleaders with me. For the lighter lines in 12-14 grams, normal 5’ Trout Polyleaders works great. Needless to say that after using the above combination with good results, I am convinced that this will be my number one choice for most of my migratory Trout fishing in both smaller and larger river during the coming season. Leif Stävmo/Product Manager, Åre, Sweden. Our Danish sales rep Brian Störup has been showing the new ULS Hybrid rods to shops in Denmark, Holland and northern Germany with great success. But the best IRL session was without a doubt with the Korsholm shop and sales manager Jimmi Lauridsen in river Kongeåen. The setup for the day was the Guideline ULS Hybrid 10`#6 with an ULS 3D+ 14 grams head and fitted with the FAVO 79 fly reel. A very light and sensitive setup, but with good backing capacity if you run into big fish. The guys tested the ULS Hybrid rod thoroughly along the small river, and they both agreed on that the system is an exciting setup for the future. The rod casts beautifully with a very sensitive blank and handles the short heads with authority but still gives smooth presentations when you need it. After just ten minutes of fishing Jimmi hooked into a decent searun brown trout of about 8 lbs, and he really liked how the rod performed during the fight. So in short this is a very exciting project that will be very popular in Denmark. 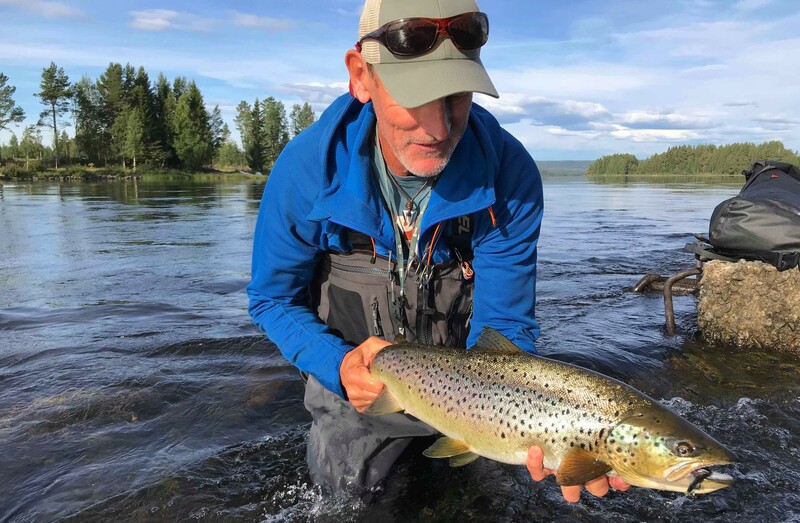 Our sales rep for southern Norway Børge Iversen reports; I have used the #7 wt ULS Hybrid quite a lot this late summer and fall and it has become my favourite rod for salmon fishing in smaller rivers. Combined with ULS 3D+ lines this is to me an unbeatable combo. For fishing in the tightest spots i use the ULS lines as is, very easy to cast and handle. At places where i have possibility to overhand ast and have more room for placing longer line beside me during spey casting i like to put on a 10ft 4gram tip from our ULS Multi Tip series. By doing this the line tracks better, the turnover goes slower and the presentation improves on these longer casts. The rod feeling is superlight with plenty of steel in the bottom to play large fish. Teamed up with a Fario LW 68 reel this has to be one of the lightest combos on the market, pure magic! I`ve been fishing with switch rods near 8 years or so, around the world. I use them at sea fishing, rivers, lakes…from sup, boat, beach etc and for every species of fishes. I have tried to find light ( weight of fly line ) switch rods for a smaller/medium size rivers, trying to catch trouts and graylings. I have tested number of different rods, example zpey etc but those wasn’t for me. Lightest i could find and works well, is from Meiser, #2/3/4. Last year i had a possibility to try new CND switch rod and it is a bit lighter, little bit softer from lower parts and stiffer from the tip then my Meiser so it was really good.